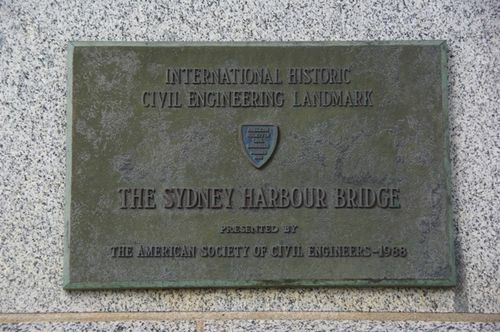 A plaque on the Sydney Harbour Bridge dedicates it as an International Historic Engineering Landmark. The American Society made its dedication under its History and Heritage Program which recognises civil engineering contributions to the progress and development of the United States and the world. Under the directions of Dr J.J.C. Bradfield of the NSW Department of Public Works, the bridge was designed and built by British firm Dorman Long and Co Ltd of Middlesbrough and opened in 1932.The bridge's design was influenced by the Hell Gate Bridge in New York. It was the world's widest long-span bridge, at 48.8 meters (160 feet) wide, until construction of the new Port Mann Bridge in Vancouver. It is also the fifth longest spanning-arch bridge in the world, and it is the tallest steel arch bridge, measuring 134 metres (440 ft) from top to water level. Until 1967 the Harbour Bridge was Sydney's tallest structure.